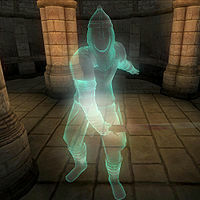 Sir Juncan is a Redguard ghost added by the Knights of the Nine official plug-in. He was a Knight of the Nine long ago. Sir Juncan wears chainmail boots, gauntlets, greaves, and helmet. He also wears a Knight of the Nine Cuirass. He wields a steel longsword in combat. You will meet the ghost of Sir Juncan in the basement of the Priory of the Nine during the quest Priory of the Nine, where he will give you the quest Nature's Fury. After completing the Knights of the Nine quests, his tomb in the basement of the Priory of the Nine grants you Kynareth's Blessing: "Kyraneth grants you the swiftness of the wild." Which gives you an additional five points to your Speed attribute. This effect is semi-permanent: it stays in effect until you activate another of the Knights' tombs and receive a different blessing. When you first speak to Sir Juncan, he will greet you by saying; "I wish to see you succeed where I failed. I was on the path to the Boots of the Crusader, but died before I reached them." Telling him that you are to busy to take up his quest at the moment will have him reply; "Then I shall await your return." Asking him to tell you more about the boots will have him tell you where you can find someone who can help you find the boots: "I cannot tell you exactly how to find the Boots, for that will be up to Kynareth. I can tell you to seek out her Priests, though. West of the Imperial City, on the edge of the Great Forest, is a shrine. You will find them there, and they will tell you what you need to know." Speaking to Sir Juncan again before you recover the boots will have him greet you by reminding you on who you must seek out to find the artifact: "Find the Priestesses of Kynareth. Only they can guide you to the boots. All I can do is set you on the path." Asking him about the Boots of the Crusader before you recover them will have him reply; "The Boots are safeguarded by Kynareth herself. You must be tested, and prove yourself worthy to acquire them." Once you have obtained the Boots of the Crusader he will thank you for succeeding where he failed; "You are an asset to your Order. You have claimed the Boots, and for this I am grateful." If you ask him about Knights of the Nine, he says: "The wars of men undermined the service of the Nine. Do not follow in our mistakes." Asking him about the Shield of the Crusader before you obtain it will have him reply; "Sir Henrik spent his days looking for the Shield. He was so determined; we all were in those days." Telling him that the Boots of the Crusader were necessary to reclaim the Mace of Zenithar will have him be saddened to hear this news: "So it was the boots that Sir Ralvas needed to complete his quest? What a fool I was to refuse to help him. I will carry this regret for all time." Esta página foi modificada pela última vez à(s) 05h48min de 20 de outubro de 2015.